237 Ruggles Ave, Newport, R.I.
With 425 feet of oceanfront property above Cliff Walk, this Rhode Island mansion has it all. From a ballroom that seats 120 guests to a stunning swimming pool, the 1875-built estate is in impeccable condition. 455 Lorraine Blvd., Los Angeles, Calif.
A classic example of American Beaux Arts architecture, the famed Dorothy Chandler estate remains a historic landmark. Of note, the ornate music room has accommodated several fundraisers attended by U.S. presidents, with the home being referred to as the “Western White House.” Designed by architects of the Hearst Castle, the property has undergone five major renovations to restore the 1913 construction. 490 W Paces Ferry Rd NW, Atlanta, Ga. According to the listing agent, this home is “ideal for lavish entertaining” with seven full kitchens, nine bedrooms, 15 bathrooms, two gyms, a grand ballroom, recording studio, salon, cigar room, movie theater, fountains, spas and a breathtaking courtyard pool. 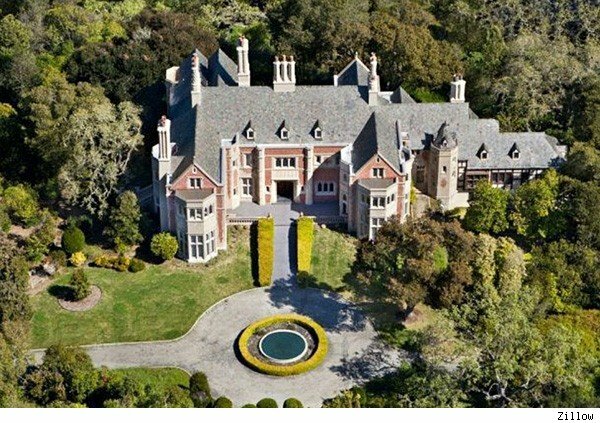 While built several years after Fitzgerald was dreaming of Gatsby’s home, the palatial mansion is undoubtedly worthy of the fictional character. 125 Northgate St, Woodside, Calif. Built in the 1930s, this estate was modeled after Hampton Court, a 16th century royal family residence in Middlesex, England. Noted architect Albert Farr used brick and stucco-cut stone, Gothic arches, ornate plaster detailing and carved-wood paneling to create the feel of a royal castle. 2467 Hidden River Lane, Franklin, Tenn.
A gated entrance, poolside cabana and rich tapestries embody the traditional Southern luxury that you’d expect on a 48-acre Tennessee estate. Other noteworthy features include an elevator, spa and separate guest quarters.